San Diego anglers are blessed with miles of accessible beaches and fly fishing the surf is a viable activity every month of the year. 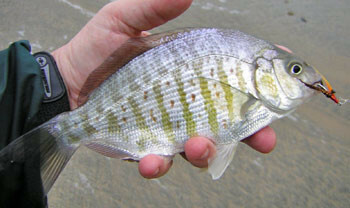 The most common surfzone species is the barred surf perch. Other species taken in the surf zone include the walleye surf perch, halibut, shovelnose guitarfish, yellowfin croaker, opal eye, spotfin croaker and the highly elusive ghost of the surf, the corbina. Gear requirements for the surf are pretty basic and an angler who already has gear for trout or freshwater bass may already have what they need to get started. Fly anglers most often use 9ft 6wt through 8wt rods for their surf zone adventures, however more anglers are starting to use longer "switch" rods. Reels should have corrosion resistant components and hold at least 50 yards of backing. Since most of the surf species are hunting in the sandy bottom for mole crabs (aka “sand” crabs) and marine worms it is desirable to get the fly near the bottom and keep it there. With the dynamic water hydraulics of the surf, a sinking fly line is essential under most surf conditions. Lines with sink rates of 3 to 6 inches per second (ips) will get the job done. Some anglers prefer full length sinking lines. Other use interchangeable shooting head systems yet others prefer an integrated shooting taper line that mates a 24 to 30 foot sinking section to a thin running line. With both shooting head systems and integrated lines, a neutral density or intermediate sinking running line will usually help the angler stay in contact with the fly better than a floating running line. Leaders can be as simple as a 4 to 8 foot length of 8 to 15 pound test monofilament. Most anglers consider a stripping basket essential for line management as the constant ebb and flow of the surf will play havoc with a loose fly line at the feet. 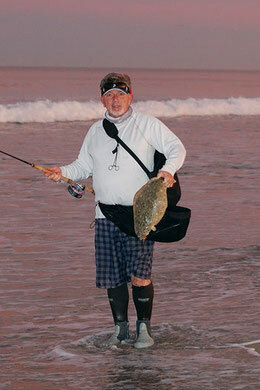 Anglers new to the Southern California surf are often surprised at how close to the beach the fish are. During the summer it is common to see the exposed backs of corbina as they ride the surf almost to the beach in searching for mole crabs (aka "Sand Crabs"). The observant wading angler will see surf perch swim by their legs or the puff of sand as a startled halibut rockets away. Casts of 40-50 feet are often sufficient to get to feeding fish. The ability to make longer casts is helpful but not essential. 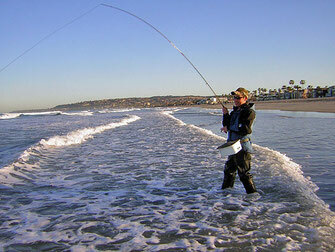 San Diego area beaches are rarely devoid of people so unless it is very early or very late in the day, anglers working the surf need to keep their eye on the area behind them since spectators have frustrating tendency to stop and watch from right where the angler wants to place a back cast. As with the bay, a wide range of fly patterns will work for surf species. 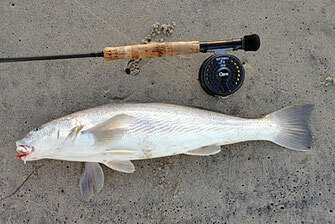 A chartreuse and white clouser deep minnow will take all surf species over a wide range of conditions. Clouser minnows in many other color combinations also produce as well as other streamers, crab patterns, shrimp imitations, and bonefish patterns. A bit of orange imitates the roe sacs of mole crabs and flies that incorporate orange or red sometimes out fish patterns that don’t. The local water rarely gets above 72 degrees F during mid and late summer and during the winter is much cooler. Some anglers wade wet during the summer but most wear waders, even during the summer, since the sea breezes can lead to a quick and deep chill. Neoprene booties or flats boots sized to fit over stocking foot wader feet are the most common footwear. A waterproof or water repellent jacket will offer protection from the elements.